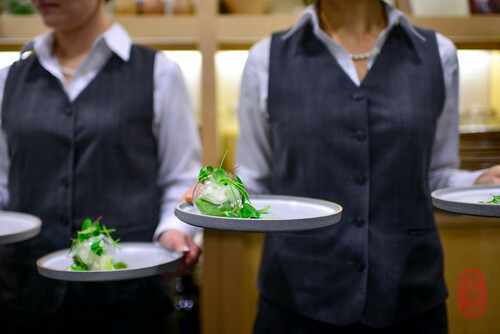 As the entire left coast braced for the largest storm to hit in decades, Nathaniel Dorn, the Restaurant Manager at The Restaurant at Meadowood, and his staff kept calm and carried on. At line-up, he reminded: “We have a generator, headlamps for all of the kitchen staff, pre-burned candles, emergency crash kits, and pre-charged music stations… if the electricity goes out tonight, the party doesn’t stop.” This is, after all, the Twelve Days of Christmas. And so, from the far reaches of northern France came Alexandre Gauthier to stormy Napa Valley. He is chef of Froggy’s Tavern in the medieval, walled city of Montreuil-sur-Mer and the Michelin-starred la Grenouillère in nearby La Madelaine-sous-Montreuil. 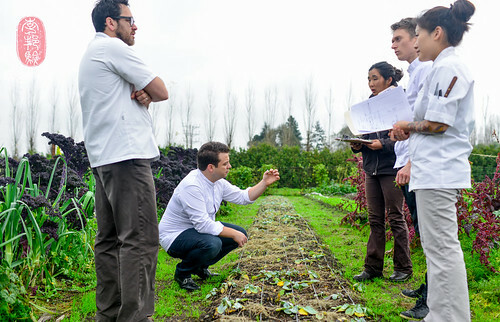 Gauthier is the fourth chef to cook at this year’s Twelve Days of Christmas at the Restaurant at Meadowood. 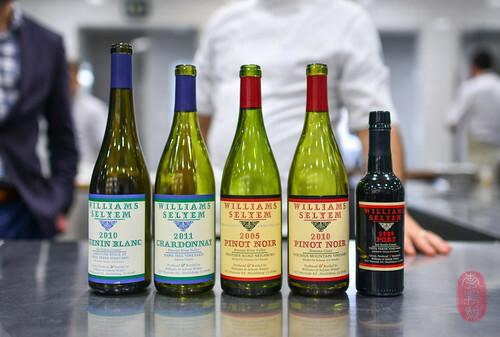 Together with hosting chef Christopher Kostow, he presented a nine-course dinner paired with wines by Williams-Selyum. I haven’t had a chance to write about my visit to Gauthier’s restaurants earlier this year. And this isn’t the right place to do so. But I’d like to give a brief sketch of his background to lend a little color and context to his cooking at the Twelve Days of Christmas. Gauthier’s father earned a Michelin star at la Grenouillère. When he lost it, he called his son Alexandre to the kitchen. With Alexandre’s help, the restaurant regained its lost star, and Alexandre eventually took over the restaurant. Although Gauthier was trained in classic, French cooking***, and much of what he cooks now is still very classically based, his presentation can be surprisingly avant-garde. Dishes like his “Egg White” have an almost whimsical look that only a Frenchman could summon. For this dish, Gauthier pipes egg white meringue into long cylinders, poaches the meringue, rolls it to slightly deflate the cooked meringue and to increase its density, and then cuts the meringue “cords” at varying lengths. These meringue cylinders are stood up on end in a cluster, appearing like a mini skyscraper landscape. At la Grenouillère, the meringue was served with macerated mirabelle plums, vinegar, and black pepper. At The Restaurant at Meadowood, Gauthier garnished the egg whites with cucumbers, purslane, and a light vinaigrette with spinach oil (inspiring one to remark that it resembled the Emerald City). The highlights at this Twelve Days of Christmas dinner with Gauthier were many. Gauthier kicked off the dinner with an absolutely stunning course of liver lined with paper-thin curls of raw red curry squash, tiny segments of tangerine, tangerine zest, and the zest of red curry squash skin. The squash ribbons were slightly crunchy, which made a terrific contrast to the silky liver. And the color association of the orange of the squash and the tangerines seemed to almost blur the line between the earthy sweetness of the former and the tangy sweetness of the latter. Gauthier also presented a stunning “red raviolo,” which appeared like a fat, ruby stegosaurus, garnished with a single leaf in mourning – dusted in vegetable ash, the lettuce seemed to be dressed in black velveteen. As beautiful as it was, I found the beet pasta slightly too thick, and, as a result, slightly doughy and undercooked. But the filling, a rich smoked haddock butter in which was suspended a runny egg yolk, was terrific. Gauthier’s squab dish was also a showstopper. The breast was juicy, tender, and flavorful, served with the thigh and clawed foot on a bed of tender green wheat and a milky green sauce with basil. Together with Kostow’s aji escabeche, this dish ranks among the best dishes I’ve had at this year’s Twelve Days of Christmas so far. One of the best dishes I had at la Grenouillère was a dessert that was listed on the menu as “le Bulle du Marais.” Inside a tissue-thin sugar glass “bubble” was a creamy and immensely fragrant, herbaceous mix of sorrel panna cotta, mint ice cream, chamomile, and fresh herbs — all from the marshlands of la Madelaine-sous-Montreuil (hence, it appeared on the menu at the Twelve Days of Christmas as “Marsh Bubble”). 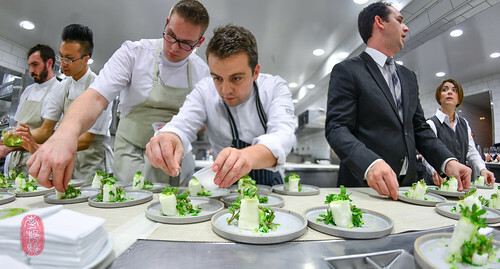 Gauthier, with the help of his young assistant Felix Robert, who is responsible for the pastries at la Grenouillère, reproduced this dessert at The Restaurant at Meadowood. The sugar glass “bubbles” were blown, set, and filled with panna cotta and ice cream made from herbs from The Restaurant at Meadowood’s garden. It was just as wonderful as I remembered it. For the guests at this dinner, this dessert offered a rather authentic taste of la Grenouillère. For me, it was chance, second meeting with one of the best dishes I’ve had this year. Below, you’ll find the menu from the fourth night of the Twelve Days of Christmas with Alexandre Gauthier of La Grenouillère and wines by Williams-Selyem. Following the menu, you’ll find a slideshow of all of the photos that I took at this dinner. Stuffed in a bolted leek. Beet pasta, smoked haddock butter, egg yolk. * From Paris’s Gare du Nord, it’s about a two hour train ride to Étaples le Touquet. From there, it’s a 15-20 minute drive to the walled city of Montreuil-sur-Mer. It’s another five minutes to drive from the city into the low-lying marshland of La Madelaine-sous-Montreuil, where la Grenouillère is located. ** Other than the lack of wireless internet, you will lack nothing in these cleverly designed “huts,” which include a hideaway bathtub, and a potbelly stove for colder weather. ~ by ulterior epicure on December 13, 2014.